It is, in all honesty, a relief for me to say that I have now been to Madrid. Being Spanish and never having visited the capital didn’t feel quite right – it was a rather embarrassing confession. But ever since one of my most precious friends moved back there four months ago, I knew it was a case of now or never. I was worried I wouldn’t get to see any street art but my friend lives in the vibrant ‘La Latina’ neighbourhood, which has a whole section full of beautiful pieces! One of my particular favourites was the one in the second picture, which is by an artist called Susie Hammer. We also unexpectedly came across some more street art in another area of Madrid called Malasaña (not too far away from the Museo ABC De Dibujo e Ilustración), like this impressive mural. I’m pretty pleased with myself for having figured out that it was a contemporary take on the mythological tale of Europa getting kidnapped by the Greek God Zeus as a bull, even though it’s pretty obvious. It was also surprisingly hard to find any information about the artist – it’s by Raul Casassola, who doesn’t seem to have any online presence whatsoever. Borondo in Madrid! What a pleasant surprise! Debod Temple! I’d actually never heard of this lovely temple until I got to Madrid and my friend told me she wanted me to see it. Just in case I’m not the only who hadn’t heard of it, it’s a temple that was brought all the way from Egypt to Madrid (Read the reason why here). Isn’t it beautifully situated? Have you ever experienced that feeling of getting to see paintings in the flesh that all your life you have seen in books? It is the most amazing feeling, which I experienced over and over when visiting Prado Museum. In fact I almost had a heart attack when getting up close and personal with Bosch’s haunting, dramatic and impressive works. I was naughty and took a few pictures at Prado… the work there is too beautiful not to share! For some reason I loved these dramatic windows at Prado. It was worth seeing Museo ABC De Dibujo e Ilustración (ABC is a famous, longstanding Spanish newspaper) just to admire the impressive building (and amazing floor seen in the first pic). It turned out to have a fascinating exhibition about the Spanish airline Iberia, which included samples of the stewardesses’ uniforms throughout the decades. This is one of the best exhibitions I’ve seen this year. Thyssen Museum‘s “Vogue: Like A Painting” – a collection of fashion photographs that emulate classic art – was overwhelmingly beautiful and inspiring. Naturally, it will be getting its own post. Toasts are a typical thing to have in Madrid… I had this delicious thing at an adorable cafe called El Azul De Fucar, located in an exquisitely bohemian area not far from La Latina. Oh yes, I found poached eggs in Madrid – it couldn’t have been a more complete trip. This amazing cafe, Federal Cafe, was my favourite – it had the exact same hipster-yet-charming vibe found in so many places in Angel or East London. 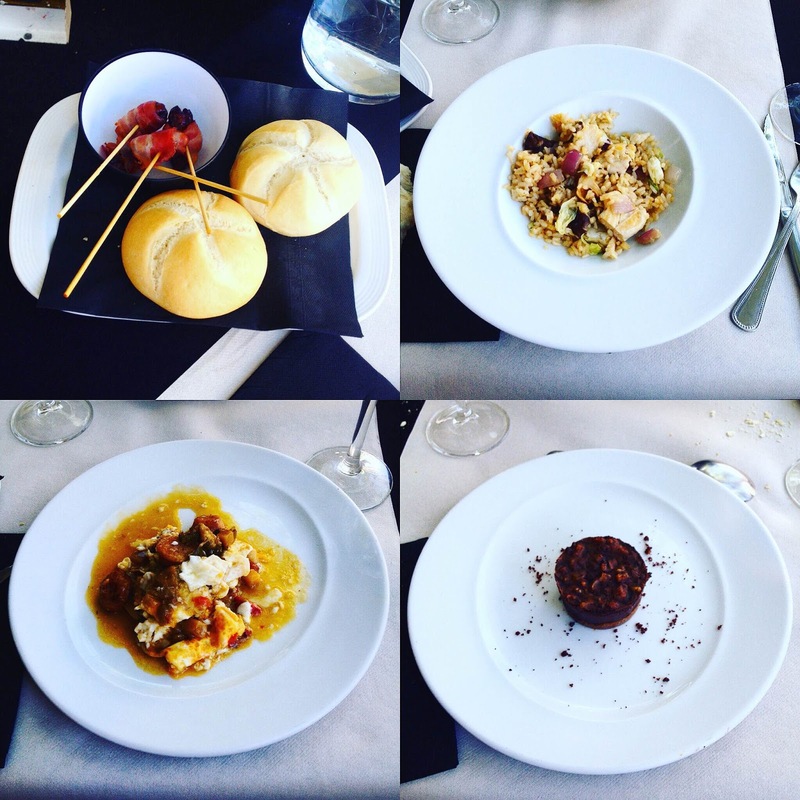 This incredible meal was at Mérimée Fuencarral, another gorgeously hip restaurant in the centre of Madrid. Another place that I would recommend for eating, drinking and chilling is Mercado de San Ildefonso – it had a truly vibrant feel that’s perfect on a Friday night. This view was witnessed from Madrid’s Circulo de Bellas Artes‘ painfully hip rooftop bar. This was actually my first meal in Madrid! Also at The Circulo de Bellas Artes (which can be roughly translated as The Fine Arts Society), I couldn’t have had a more delicious welcome. This beauty is in Madrid’s stunning Buen Retiro Park – yes, Madrid has an actual Crystal Palace that’s pretty breathtaking. Apparently there are exhibitions held in this Crystal Palace on a regular basis, but when we went it was empty – which made it look even more spectacular. Oh how I should have visited this city a lot sooner! It’s been over a month and I’m still daydreaming about sunny walks, Spanish cafes and lots of classical art. Madrid, you were amazing – see you again soon. All photographs taken by moi and Ruth in Madrid between the 11th and 13th of September.